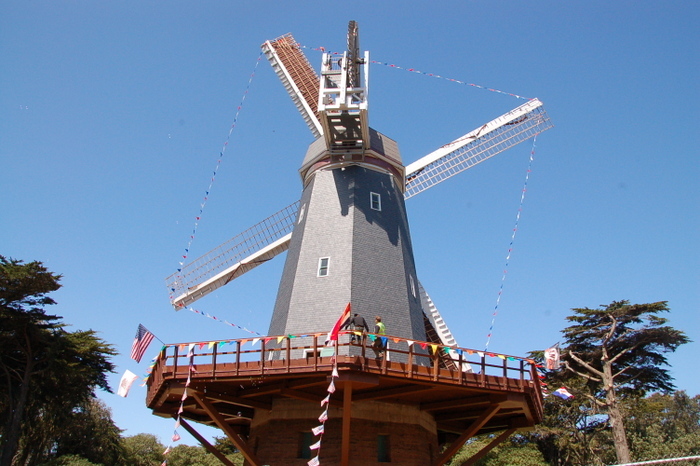 This year’s celebration of the Dutch Queen’s Day in San Francisco was a bit special. 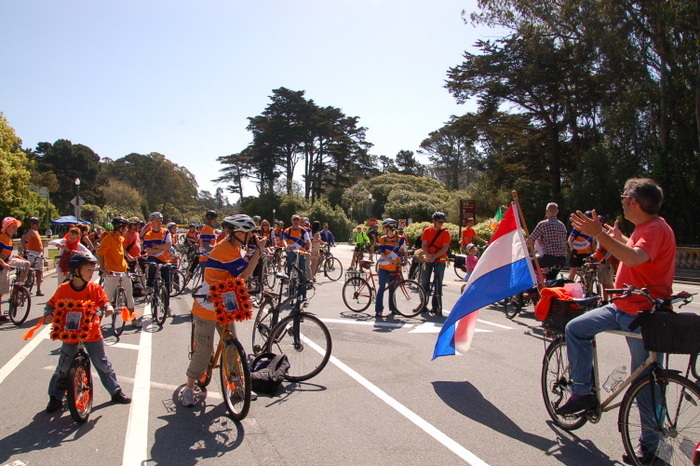 When the event’s 100-or-so celebrants traversed the city by bike in the second annual “Market-to-Mill” ride (Market Street to the Dutch windmill in Golden Gate Park, a.k.a the Bay to Beach route), the orange-clad caravan traveled through San Francisco’s first bicycle lanes designed with a Dutch standard of safety in mind. 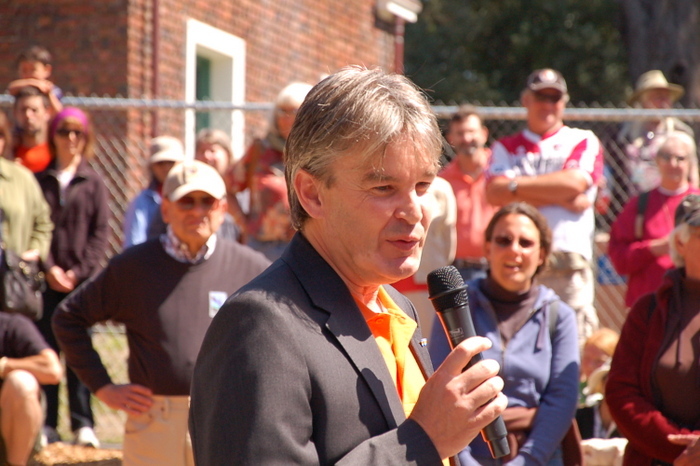 Bart van Bolhuis, Consulate General of the Netherlands, told Streetsblog that riding the new parking-protected bike lanes on John F. Kennedy Drive felt like cycling in his home country. 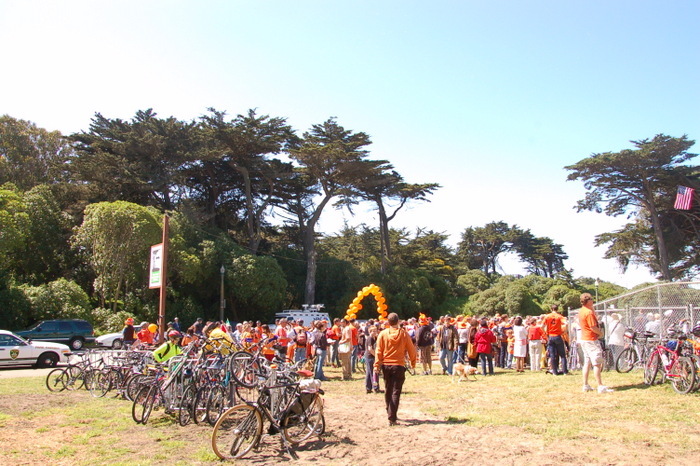 “Especially biking with 100 people dressed up in orange,” he added. 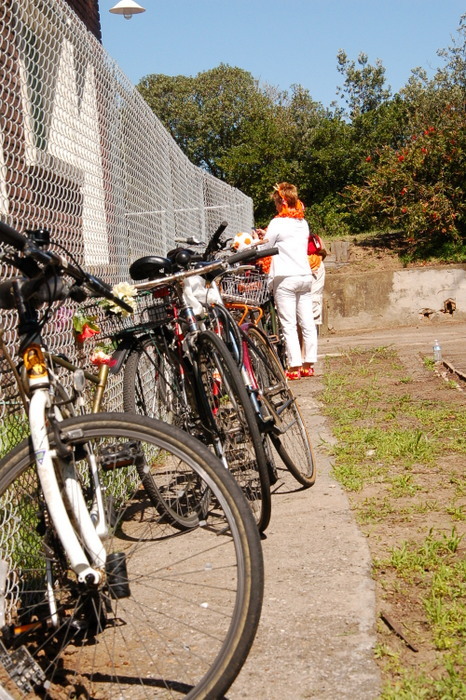 A key feature of the JFK bikeway, Bolhuis pointed out, is the buffer area which separates bicycle riders from the door zone and provides space for people getting in and out of their cars. Most conventional bike lanes in San Francisco place riders in the path of opening car doors on one side and passing cars on the other. Drivers also make regular incursions into the bike lane to maneuver into parking spaces or double park. That creates an obstacle course that’s too stressful for most people to ride in. By placing bicyclists to the right of parked cars, JFK is the first street in San Francisco designed to accommodate car parking while eliminating those hazards. Transportation planners in the Netherlands have been refining separated bikeway designs since they ramped up their implementation about 40 years ago. Today, bike trips account for 37 percent of all trips in Amsterdam (58 percent in the city center), and just about everyone who’s able to ride does so regularly. 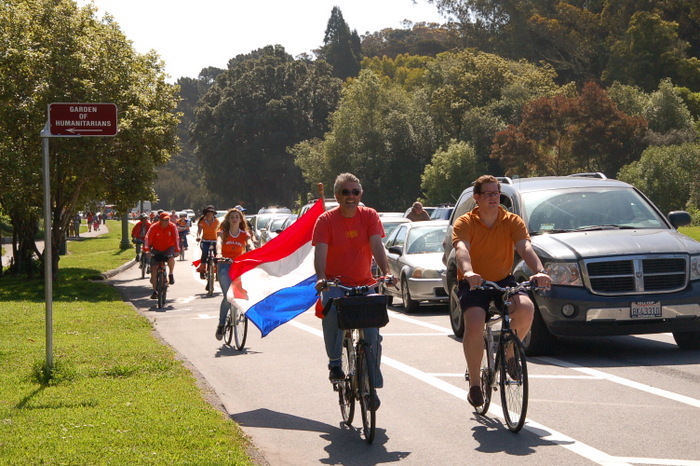 Bicycling in San Francisco could some day feel as safe and normal as it does in the Netherlands if the city continues providing more protected bike lanes and traffic-calmed streets in the coming years. The SFMTA consulted Dutch bicycle planners last September to get ideas for improving three of San Francisco’s most important bicycling corridors (the JFK project wasn’t included). The agency is currently developing plans to administer some of those recommendations, the first of which will be on the Wiggle. “This really is about ensuring greater access on our streets for San Francisco’s diverse population, who is biking more and more,” she added. 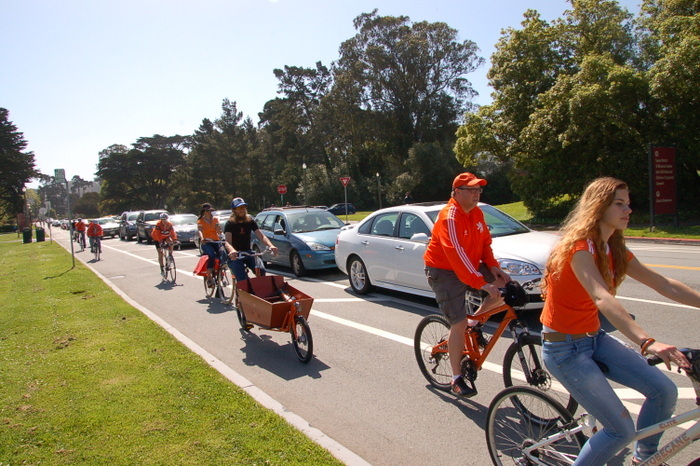 The JFK bikeway, which Shahum noted could be looked to as a model for planners in other cities in the Bikes Belong Foundation’s Green Lane Project, seems to be quickly growing on San Franciscans and park visitors and has had a profound traffic-calming effect. More and more people — young and old, experienced riders and casual riders — can be seen using the lanes every day. As was the case in other American cities that have implemented protected bike lanes, drivers also appear to have grown accustomed to floating parking lanes, and the bike lanes are rarely, if ever, blocked by cars anymore. How did the city of San Francisco overcome the Caltrans Highway Design Manual rule for bike lanes which states under section 1003.2: Bike lanes shall not be placed between parked cars and the curb? Los Angeles DOT believes that a bike lane like this would be an experiment that has to be approved by Caltrans. The reason I am asking is that I am trying to get Los Angeles to start putting in these types of protected bicycle lanes and so I am interested to see how cities such as Long Beach and San Francisco are overcoming this Caltrans rule. This new plan is not safety for walkers and people with disability. Car should not be parking in the middle of the roadway. The park needs to be for everyone not just people on bikes. The park needs to be for everyone not just people in cars. Richard’s comment is very insightful into the mindest behind the knee-jerk opposition to the revival of urban bicycling–resting, as it does, on the belief that the existence of bike infrastructure is an inherently wrongful usurpation that oppresses all other road users. In reality, up until now the JFK corridor has afforded dedicated space to every user *except* bicyclists. Yet motorists are not magically entitled to dominate every inch of paved public roadway–in Golden Gate Park, or anywhere else for that matter. False. Having lived and biked in Amsterdam for a year, I felt safe and normal because there weren’t people driving recklessly everywhere, and the road design doesn’t allow people to drive fast. Many streets don’t have any special bike treatment, but cyclists are tolerated and there exists the concept of SHARING the road. I believe separated bike lanes, while appropriate in Amsterdam, in SF will only reinforce the idea that bikes don’t belong on the street. While I appreciate the gesture, I would take traffic calming and enforcement of traffic laws over protected bike lanes any day. @Dennis Hindman: The City of Long Beach has an approved request to experiment from both the state and the feds. LA doesn’t need to get its own approved request, they can ride Long Beach’s coattails. Mixed traffic-calmed streets are great, too. Different tools for different streets. I fail to see how this plan is not safe for walkers or people with disabilities. Both can safely continue to use the sidewalks that are found on both sides of the roadway, separated from cars and cylists. The only potential conflict is when people unload from their parked vehicles. But, experience from Europe and New York City have shown that drivers and cyclist are much more cautious around the parked vehicles since the roadway is effectively narrowed on both sides of the parked cars. I’ll remind car drivers that cyclists have been contending with much more dangerous situations with double parked cars and people flinging their doors open into the travel lane for decades. I agree from a little bit of time in Copenhagen: there’s many many streets that are just the same sort of regular street any American would recognize: sidewalks, parked cars at the curbs, 1 lane of traffic in both directions with no stripes anywhere that are shared by bikes and motor vehicles. It’s when you get to more major streets that the separation begins. And many, many patient drivers who were willing to move very slowly through pedestrian thoroughfares, etc. And many, many patient bicyclists who were willing to make square left turns where there were bike paths, etc. And many, many pedestrians that didn’t even turn to look at that car approaching them from behind because of trust and who patiently educated the poor tourists walking out of stores to stand in the bike paths. Don’t think of that way: think of the “road” (which I assume you define to be the paved part that cars can drive on) as ending where the buffer lane begins. A cycletrack is just like a sidewalk except it uses painted lines (in this particular case) rather than a curb/grass to separate itself from the “road”. You can put it all together and think of the new JFK as a road with a double “sidewalk”: the inner one for cyclists (which we’ll call a cycletrack) and the outer one for pedestrians. This new type of bicycle infrastructure must be thought of differently. Cars are not “parking in the middle of the roadway” but in fact parking on the edge of the region that is designated for cars. It will take some getting used to, but it will work out great in the end and everyone will be safer and our cities more livable. For our seniors and mobility disabled citizens, the distance you are exposed in an unprotected crossing is shortened under this scheme – instead of one long “sprint” to cross the trafficked area, one now crosses a short distance of bike lane, where bikes should be conditioned to the presence of pedestrians and give them the right of way, then you are in an island protected by the buffer and parked cars, then you have a shortened distance across the lanes of motor vehicle traffic to the next protected island of parking and buffer, and finally a short distance across the final cycletrack. While the distance in feet of crossing may be the same, it is now split into three shortened segments that allow for a rest in between if necessary. Further, this design change, included the installation of a number of extra curb cuts (ramps from street grade to the the existing sidewalk), situated near the handicapped spaces, that were not in place before. There have even been striped crossings installed in the bike lane from some of these cuts to the handicapped spaces as a further reminder to bicyclists to slow down and be aware of pedestrians. This is certainly a different design than some people may be used to, however, I think it is incorrect to state that this is not safe for the elderly who may be mobility impaired or the disabled. The implementation of this project was delayed specifically to take into account the needs of mobility impaired seniors and the mobility disabled citizens of our great city. Our seniors are a significant percentage of the folks hit by cars year in and year out. Per the last figures (2009-2010) I saw for the CA Office of Traffic Safety, pedestrian fatalities involving seniors were up 4.6%. (http://t.co/y1gasWW). Projects that shorten long crosswalks such as this one can be part of an attempt to bring this tragic number down. The Long Beach facilities are bike paths adjacent to the roadway, signed as such, not bike lanes. This makes their use optional for bicyclists. As far as I know, San Francisco simply chose to break the law and assumed that no one would be interested in bringing a lawsuit to stop them; Caltrans sets the standards, but there’s no administrative enforcement mechanism. I’m not aware of any requests to either FHWA or CTCDC for experimental authority. I’m afraid that’s not so, for two reasons. First, approval of a request to experiment applies only for the jurisdiction, and at the location(s), identified in the request. (FHWA and CTCDC have, in fact, declined to approve additional experiments with treatments that are already under study elsewhere.) This is different than an interim approval, which is available to any jurisdiction that agrees to the conditions. Second, the entire request to experiment process applies only to traffic control devices. I’m not aware of a mechanism for a local agency to get authority to deviate from the other HDM requirements; AB 819, under consideration in the Legislature, would change this, however. Long Beach avoided this problem, arguably, by making their separated facilities bike paths, not bike lanes. It’s true that most of what’s in the HDM is just guidance, but there is a provision of state law that makes the HDM mandatory for bikeways. Ah, thank you. Sorry to sow confusion. I’m a card-carrying bike coalition member, and I am not happy with the new lanes. The view of everything on the left is blocked by the lines of parked cars. There’s also a lot of foot traffic from the parked cars. We end up bicycling so slow in this new setup. Its more stressful, because there are more non-moving objects. Hear, hear. I, like the 5 fans of this Facebook pagex preferred it when the parked cars blocked my view of the park to the right instead, and when people were unnecessarily put in danger of moving motor vehicles. I had a lovely time riding in the bike lanes on JFK to the DeYoung museum today. There were no cars at all parked in the bike lane! A couple huge SUVs did have their tires into the striped area. None of the smaller cars did. On the way to the museum, I had to slow down for a couple in a bicycle surrey (the ones they rent out of Stow Lake) who were hogging the lane a bit. A quick “On your left” and I was past them. They slowed me down maybe half a second? On the way back there were four guys walking in the bike lane, not, apparently, to get to any car. (Somehow the asphalt pedestrian path six feet to the right was uncool? I wonder if the bike lane were painted green would it still have been as attractive to them?) I called out “Excuse me” in a loud, friendly manner, they glanced behind them, said sorry, and got out of my way. These guys did cause me to slow down significantly–delayed me maybe a second? And then on the panhandle path, there were three pedestrians in a clump walking down the left hand side of the path and another guy walking on the righthand side of the path, leaving me no room to get between them. This required me to slow down yet again until space opened up between them. Gosh another second lost! That made two and half seconds of my life wasted, two and a half seconds I’ll never get back, but the views of the rhododendrons, the relaxation from not having to compete with cars, and the clean air were easily worth it. Exactly! Any slowing/lost time is minimal at best (seconds, not minutes or portions of an hour). The safety benefits >>> than any insignificant delay. The strangest thing to me about these complaints is that since drivers stopped blocking the bike lanes, I have not once experienced a noticeable slow-down or felt unable to pass someone, and I ride this thing nearly every day (just for fun if not for travel). My pace is on the casual side, but not abnormal. If I had to name an issue I continue to find, it’s with a few grate dips and the occasional jogger (which is obviously an issue of compliance). I would also point out, from my experiences riding in Denmark, that this is pretty much what it feels like riding in protected bike lanes with other people. Except there, people have established the norm of keeping to the right unless passing. But what you find is that when you get the majority of people on bikes, the pace they ride at is simply slower than the current norm in SF (especially when there’s no worrying about cars). Are we supposed to win over people who have complaints by mocking them? As Streetsblog readers are surely aware, when it comes to public transit, pedestrian safety, and above all good bicycle infrastructure, the Dutch are the global champions.